Our latest trip to Busch Gardens started with a tasty, if slightly unhealthy, breakfast at Denny’s on the 27 and then we headed off into the sun for a day in Tampa. It took us just under an hour to get to Busch Gardens. It was a Friday and we were not too sure how busy it would be. We arrived at 12 noon, parked easily enough and got the little train over to the entrance. The park was healthily busy but not too bad at all. First stop was the Alligator Pen; wow some awesome beasts in there. Lazy so-and-sos the day we were there, they all just lay there sleeping. It was not feeding day as they only feed them every 3 days or so but apparently that is good to watch. Phone ahead find out what days they are feeding. Second stop was the Monkey sanctuary; this was my favourite part of the day as I managed to get some really good pictures and a video where the baby chimp was kissing the glass about an inch from the camera, it is so cute. We also visited the Lions den where a male and female lion were lazing about, again got some good photographs of these magnificent creatures. Also some hyenas, we were both surprised at how big they were, bigger than they look on TV. We then got on the little steam train and went for a leisurely ride around the “Serengeti” again managing to get some really good photographs, especially of the Rhinos and the little baby one too and my favourite the Giraffes. The jeep safari is pretty good and a little bumpy. They let kids sit next to the driver; ask when you are queuing up. The kid then becomes the guide and they have interaction with the driver which is quite funny if a little corny! The water ride was great fun. Everybody in the raft got drenched apart from me! Got a bit wet from the blasted 25 cent water cannons on the bridge, just wait till I catch up with those kids...lol! Last on the list was the wooden Roller Coaster, which I only agreed to go one with hubby. Have to say I did not like it! It was quite violent and very fast! Thrill seekers will be queuing up for more. We left the park around 1830 as it was shutting at 1900 that night, so although we had only been there for 6 ½ hours we managed to fit it all in and left feeling really content that we had had a great day out. 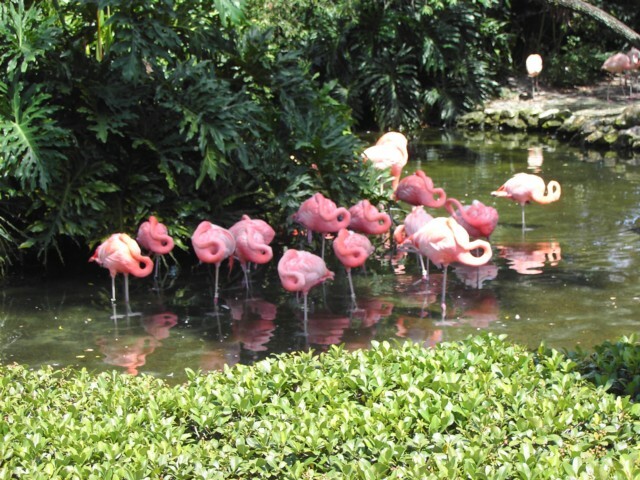 Busch Gardens is a much less hectic than other parks and it really is a great family day out. As an adult I preferred Busch Gardens to Animal Kingdom. Viewed 4435 times since 1 September 2008.